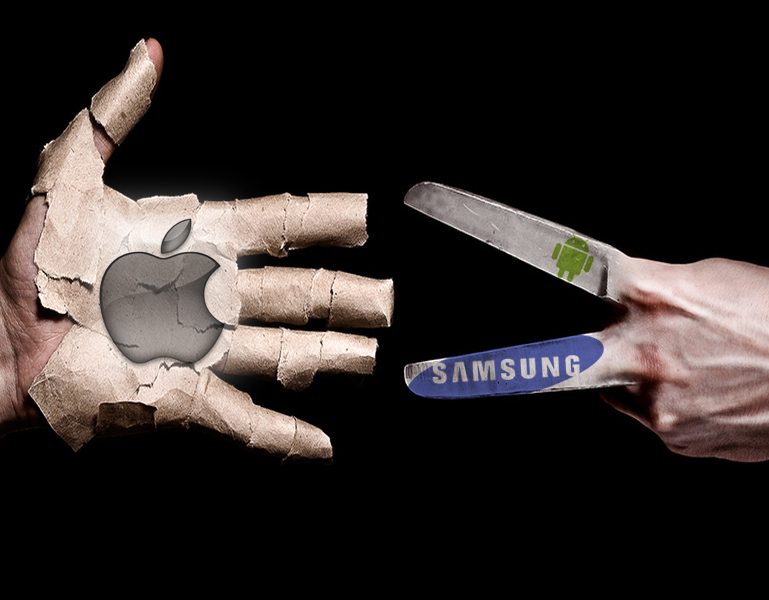 Mobile technology giants are at war again. Apple and Samsung reappeared yesterday at a federal court in Silicon Valley after being entangled in a new patent infringement case. Apple claims that Samsung infringed five patents in newer devices, which include Galaxy smartphones and tablets. It has also claimed that Samsung infringed on features such as universal search, autocomplete and slide-to-unlock. Apple has sought the court to impose a $40 royalty for every infringing device that has been sold in the US. This is more than five times of what they went after from Samsung in their first similar trial in 2012. “Apple revolutionized the market in personal computing devices. Samsung, in contrast, has systematically copied Apple’s innovative technology and products, features and designs, and has deluged markets with infringing devices,” the Apple attorneys wrote in their court filings. Samsung has a counterclaim. It accuses Apple of stealing two of Samsung’s ideas such as a wireless technology system intended to speed up sending and receiving of data as well as imaging, audio and video on recent models of iPhone, iPad, iPod touch and MacBook Pro. “Samsung has been a pioneer in the mobile device business sector since the inception of the mobile device industry. Apple has copied many of Samsung’s innovations in its Apple iPhone, iPod, and iPad products,” also wrote Samsung’s attorneys. The two rivals faced the court of U.S. District Judge Lucy H. Koh, who overruled on Sunday the objections of Samsung to show jurors a recent instructional video on how patent work ahead of the trial. “At a minimum, the video strongly suggests that Apple’s products are innovative and patentable. Showing the jury such a video would be prejudicial to Samsung and threaten the impartiality of the jury, according to the filing,” Samsung’s attorneys stated in the court filings. However, Judge Koh said that the parties involved must bring the November 2013 version of the video, including a handout referenced in the video in the jury binders. Samsung already lost a patent case against Apple in 2012, which Judge Koh also presided over. The court initially asked Samsung to pay nearly $1 billion, later reduced to $929 million. Now, there’s a third-wheeler in the scene: Google. Which makes things more interesting. Google creates the Android operating system (OS) that Samsung uses on the mobile devices being questioned. If Samsung loses case on this, Google will most likely make sweeping changes to its OS as well. There are allegations that maybe Apple is after Google, after all. Apple stood firm on its ground and maintained that these patent battles are all about innovation and the hard work that goes with it. If Samsung loses, it could cost them $2 billion. Otherwise, it could cost Apple around $6 million. The case, under a jury of four, is expected to last for a month.